I try it now , the comand for use one only gpu ? ( i have gtx 980 and Intel HD 4000 , and i want use only gtx 980 ) Thanks . My fork uses the kernel from the Go miner, so you’re right about it not bring faster. The increase was only compared to the original C miner. Genoil , on my windows 10 x64 dont work , it’s stuck on Initializing… , and dont mining ( past 5 minutes ) . I have GTX 980 overclock 1500mhz . No wait , im mined 1 block at 19.220 mh/s ??? i think work on my intel hd 4000 , i put in the string .bat -d 0 ( and work intel hd 4000 ) , put -d 1 and message error says not device #1 installed open CL . If you have multiple different GPUs like Intel and Nvidia or AMD you will have to select the platform (-p option) and device (-d option) ids. I have 1180 mh/s on windows 10 x64 intensity 28 win gtx 980 OC 1500mhz . With siacoin GPUminer have 1250 mh/s . hashrate drops from 1500~1600M to 1200~1300M comparing with go miner. This is 99.9% plain forked from the folks at SIA themselves. I’ll see if I can get it back on par with the GO client. It’s the same OpenCL kernel as gominer. Not faster. I really don’t see the point. I have two GTX970 in SLI. 430 MHS is slow for GTX 970, try the Go Pool Miner. What is the profit ratio of the SIA compared to ETH ? Current profitability of Sia should be higher with the right GPUs compared to mining ETH on them, especially on cards that do not perform that great for ETH mining such as most Nvidia GPUs and some of the AMDs. You need to compare the hashrate you get for ETH and for SIA with the hardware and then do the math to see how much you can mine per day and what is more profitable. Tried Googling it but came up without any useful results. How to run it on 2 cards? For two GPUs you need to separate instances of the miner, if the video cards are both AMD or both Nvidia you need to use the -d option with different device id, if they are different like one AMD and one Nvidia then you may need to also set platform id. which currencies can be mounted with this sgminer? as change the configuration of .bat to suprnova? 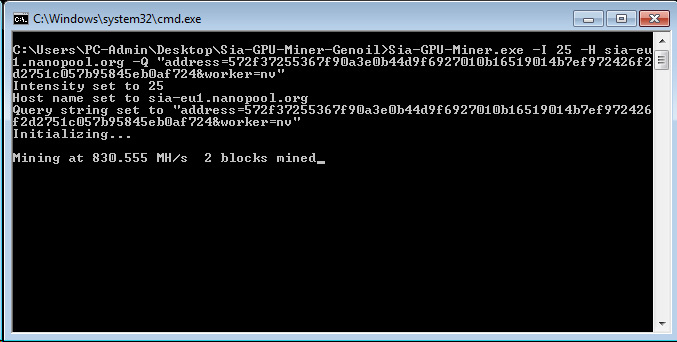 Sia-GPU-Miner.exe -I 25 -H sia-esp.suprnova.cc:3453 -u user.1 -p x …. ?